It is hard to live the American Dream when the deck is stacked against you. Our politicians stood idly by as millions of good paying jobs were shipped overseas, our economic infrastructure was absolutely gutted and multitudes of small businesses were choked to death by miles of red tape. Now, we are reaping the consequences. In America today, nobody has a job in one out of every five families, and there are more than 100 million working age Americans that are currency not working. And thanks to our transition to a “service economy”, many of those that are actually working are deeply struggling too. According to the Social Security Administration, 51 percent of all American workers make less than $30,000 a year. And the Federal Reserve says that 47 percent of all Americans could not pay an unexpected $400 emergency room bill without borrowing the money from somewhere or selling something. That means that about half the country is flat broke, and things get even more precarious for working families with each passing day. Of course the plight of working families is not something that is new. 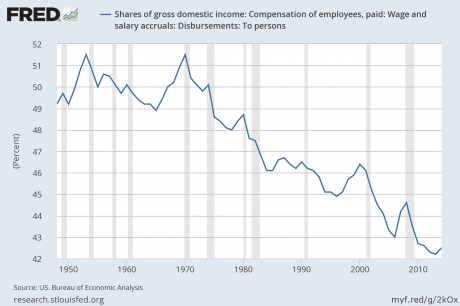 Back in the 1950s and 1960s, wages and salaries earned by workers accounted for around half of all gross domestic income. 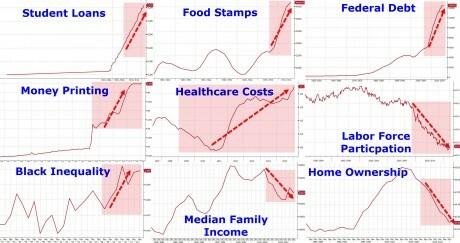 But since 1970 there has been a precipitous decline, and during the Obama administration we hit an all-time low. In other words, the share of the pie being enjoyed by working families just keeps getting smaller and smaller and smaller. Of course just about every other economic indicator shows the dramatic decline of the middle class as well. As you can see from this set of charts from Zero Hedge, median family income, the labor force participation rate and the rate of homeownership are all way down over the last decade. Meanwhile, the U.S. national debt, the number of Americans on food stamps and healthcare costs are way up. Does that sound like a “healthy economy” to you?